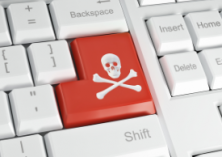 Danish anti-piracy group RettighedsAlliancen is taking a scattered approach to combat piracy. The piracy 'disruption machine,' as they call it, distributes a list of hundreds of pirate sites to ISPs, ad-brokers, search engines, payment processors and other intermediaries, who all expected to take action in response. In the future, this could expand to social media sites and web browsers, the group envisions. Over the years copyright holders have tried a multitude of measures to curb copyright infringement, with varying levels of success. By now it’s well known that blocking or even shutting down a pirate site doesn’t help much. As long as there are alternatives, people will simply continue to download or stream elsewhere. Increasingly, major entertainment industry companies are calling for a broader and more coordinated response. They would like to see ISPs, payment processors, advertisers, search engines, and social media companies assisting in their anti-piracy efforts. Voluntarily, or even with a legal incentive, if required. In Denmark, local anti-piracy group RettighedsAlliancen has a similar goal and they are starting to make progress. The outfit is actively building a piracy “disruption machine” that tackles the issue from as many sides as it can. The disruption machine is built around an Infringing Website List (IWL), which is not related to a similarly-named initiative from the UK police. This list is made up of pirate sites that have been found to facilitate copyright infringement by a Danish court. “The IWL is a part of the disruption machine that RettighedsAlliancen has developed in collaboration with many stakeholders in the online community,” the group’s CEO Maria Fredenslund tells TorrentFreak. The stakeholders include major ISPs, but also media companies, MasterCard, Google, and Microsoft. With help from the local government they signed a Memorandum of Understanding. Their goal is to make the internet a safe and legitimate platform for consumers and businesses while limiting copyright infringement and associated crime. There are currently twelve court orders on which the list is based and two more are expected to come in before the end of the year. As a result, approximately 600 pirate sites are on the IWL, making them harder to find. 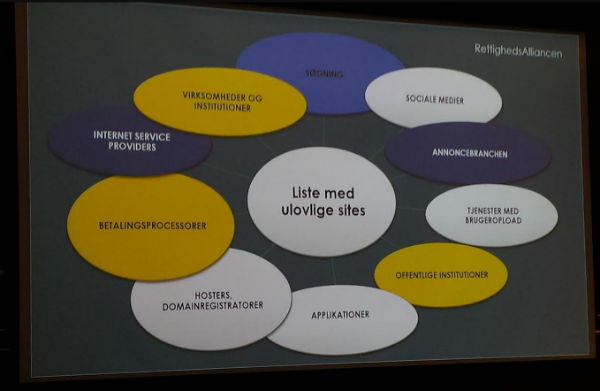 Every time a new court order is handed down, RettighedsAlliancen distributes an updated list to their the network of stakeholders. 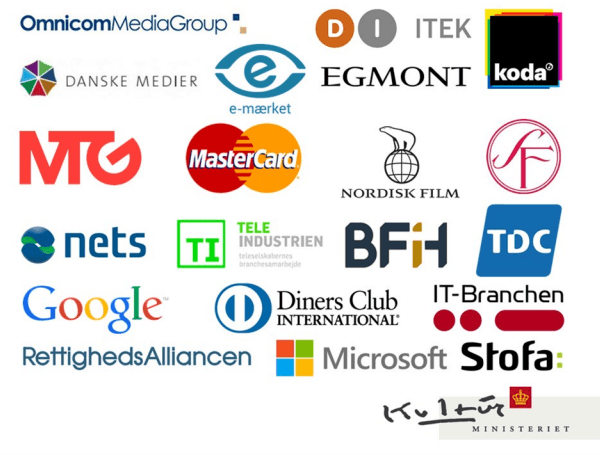 “Currently, all major ISPs in Denmark have agreed to implement the IWL in their systems based on a joint Code of Conduct. This means that all the ISPs jointly will block their customers access to infringing services thus amplifying the impact of a blocking order by magnitudes,” Fredenslund explains. Thus far ISPs are actively blocking 100 pirate sites, resulting in significant traffic drops. The rest of the list has yet to be implemented. The IWL is also used in the online advertising industry, where several major advertising brokers have signed a joint agreement not to show advertising on these sites. This shuts off part of the revenue streams to pirate sites which, in theory, should make them less profitable. A similar approach is being taken by major payment providers, who are preventing known pirate sites from processing transactions through their services. Every company has its own measures, but the overlapping goal is to frustrate pirate sites and reduce copyright infringement. It’s interesting to see that Google is listed as a partner since they don’t support general website blockades. However, Google said that it would demote sites on the IWL in its search results. While these are all positive developments, according to the anti-piracy group, it’s just the start. RettighedsAlliancen also believes other tools and services could join in. Browser plugins could use the IWL to identify illegal sites, for example, and the options are endless. “Likewise, large companies, institutions, and public authorities are also well-suited to implement the IWL in their local networks. For example, to prevent students from accessing illegal content while at school or university,” Fredenslund says. This model is not completely unique, of course. We’ve seen several elements being implemented in other countries as well, and copyright holders have been pushing voluntary agreements for quite some time now. What’s new, however, is that it’s clearly defined as a strategy by the Danish group. And by labeling the strategy as a “disruption machine” it already sounds effective, which is part of the job.